There is a new ccminer skunk-krnlx fork (source) available that comes with improved SkunkHash-Raptor performance. The miner is open source and provides the same performance for mining Signatum (SIGT) – the altcoin that has introduced this new crypto mining algorithm. This new free and open source miner does come with a performance very similar to that of the fastest closed source miners for Nvidia GPUs that are available for sale, so you might want to give it a try. There are no official binary releases available, only the source code, but we have for download a 32-bit Windows binary compiled with VS2013 and CUDA 8.0 that you can try if you are having trouble compiling the code yourself. 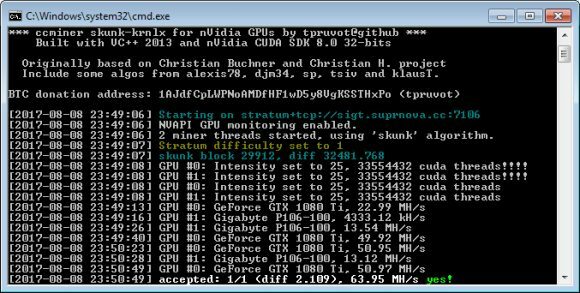 AMD miners might want to check out the Prospector miner for better performance on Polaris GPUs, though this miner is only available as binaries and is not open source, so proceed with caution. Do you have a newsletter, so that I will get informed about new blog entries from you? Windows Defender deletes your exe, if you turn it off it will work fine. as of writing, CWI Miner is actually faster. Is there ANY miner for this algorithm that supports AMD R9-290 cards at a decent speed on Linux? It seems this is only worth mining on RX series and nVidia cards. use intensity 21 for gtx 1070 otherwhise you get out of memory with i 24.